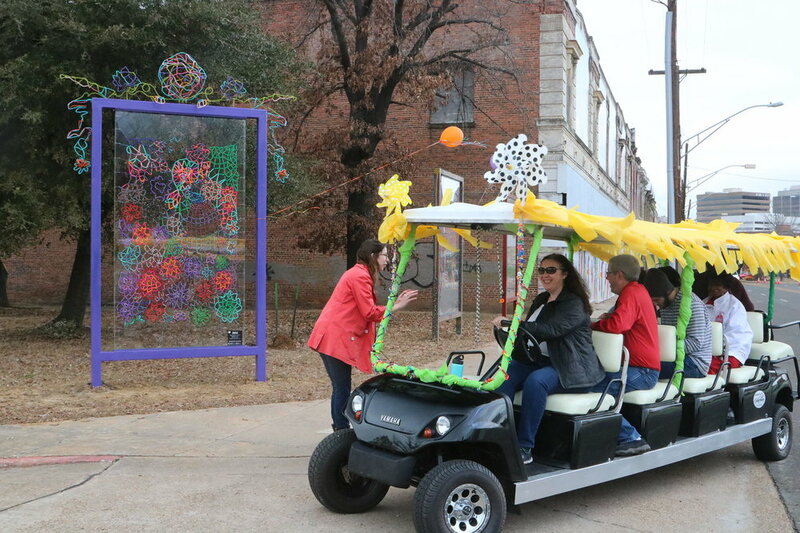 The Shreveport/Bossier community kicked off new years with a ride on a golf cart or a bike or walk through the trail of 20 nationally renowned Soundsuit Artist “Nick Cave” inspired and community “Bead-A-Thon” created blankets that were framed and permanently displayed throughout the creative community of Shreveport Common on Saturday, January 20! 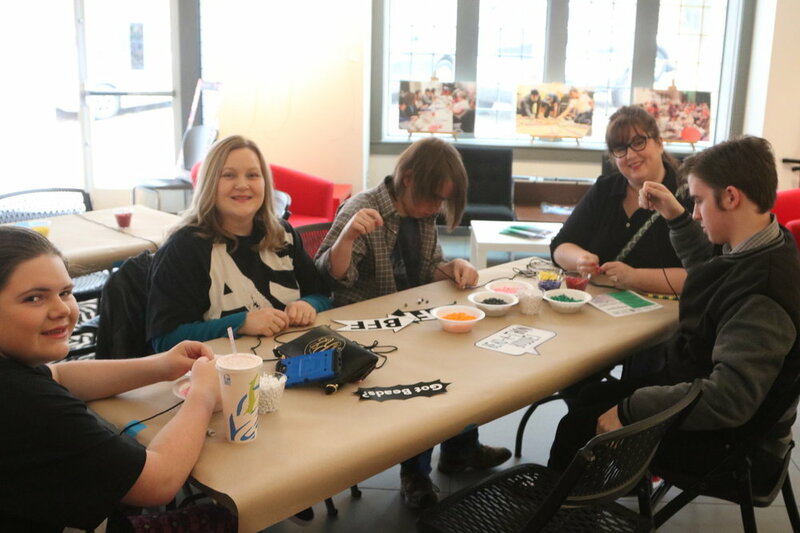 The artists behind the blankets, frames and stories were on hand to meet and greet at their frames. 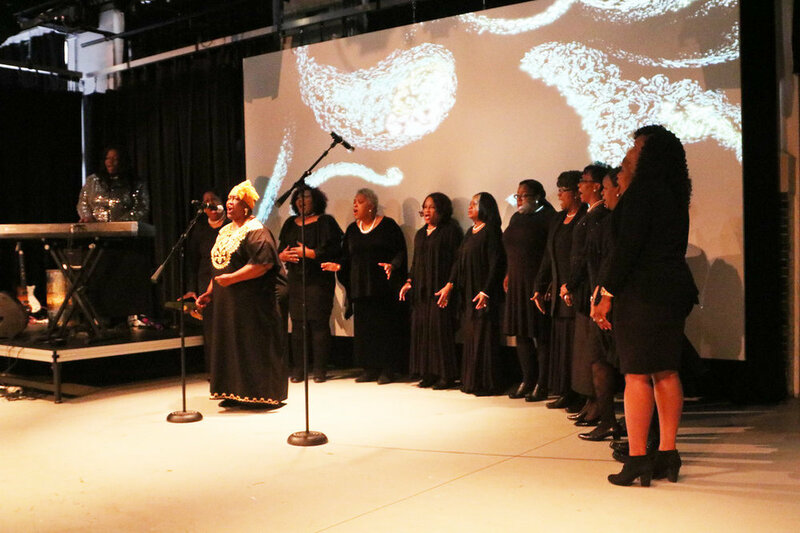 Performances were enjoyed in the ArtStation Engine Room from the productions of “AS IS” and “UNTIL” by Nick Cave performed by musician Michael Futreal, soloist Brenda Wimberly, accompanist Sereca Henderson, and choreographer Luther Cox, Jr. of Inter City Row Modern Dance Company. Once upon a time, art on buildings might have been considered mere graffiti, or in downtown Shreveport served to advertise a 5 cent biscuit made by Uneeda or sheet music available through Williams. Today “street art” is the new fine art, and murals are the new go-to strategy for economic community development, creative placemaking (turning a blighted area into something attractive) and beautification efforts. On April 1, murals created by eleven Northwest Louisiana artists and one nationally known, Dallas-based mixed media artist Lesli Marshall were unveiled in the nine-block area on the western edge of downtown Shreveport known as Shreveport Common. Rock and Roll Hall of Fame member and Grammy Award-winning guitarist James Burton rocked artspace this summer with a never-before-seen exhibition of his rare and collectible guitars and personal memories of his years playing with Elvis Presley and Ricky Nelson. The weekend of August 4, 5 and 6 the Master of the Telecaster “took to the streets” in downtown Shreveport with a Classic Car Show; Street STRUMMING; a JAM SESSION led by Burton and another original “Wrecking Crew” band member, Joe Osborne; an outdoor showing of “Black and White Nights” with James Burton and Roy Orbison and two Burton concerts. Every year on Mardi Gras, the sparkling beads, jangling of tambourines, and chants of “Creole Wild West” announce to the world that the oldest Mardi Gras Indian tribe is still “masking” in New Orleans. In 2017 Big Chief Howard Miller and his tribe brought their hand-beaded and feathered “suits” to Shreveport as artists in residence with the Shreveport Regional Arts Council. Mardi Gras Indians are, above all, artists. Their elaborate beadwork and sewing, the intricate rhythms of their music, and the closely kept traditions of their heritage are woven into the fabric of a culture unique to New Orleans. The Creole Wild West shared the importance of celebrating the heritage and culture of a rare Louisiana tradition at UNSCENE! The January 28 UNCENE! included a Mardi Gras Indian style parade in and around Shreveport Common, an artspace exhibition of 10 hand-beaded Indian suits with headdresses, crowns, blankets and embellishments; and a beading and sewing workshop taught to the community by Big Chief Miller. Renowned performance artist Nick Cave came to Shreveport to deliver a message. Are you ready to listen? 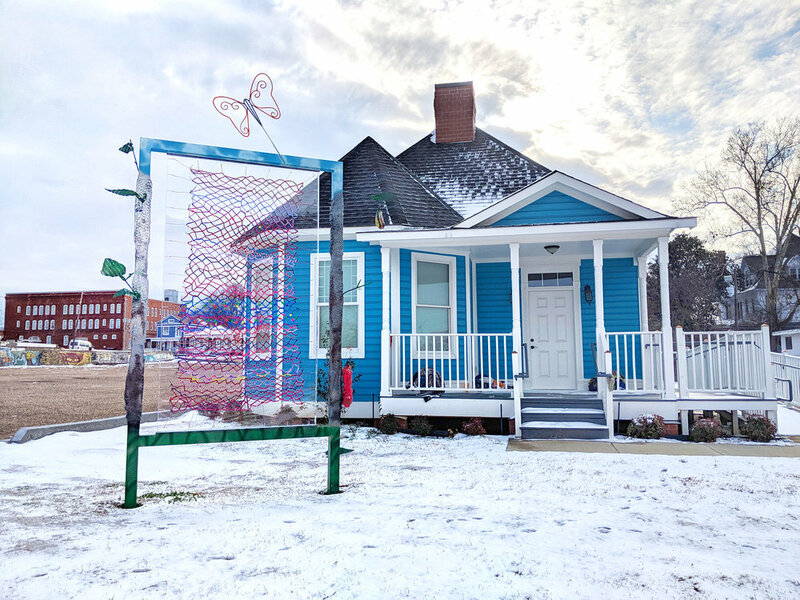 On March 20 audiences had the chance to learn about the stories of numerous volunteers, local artists and participants from four social service organizations in the nine-block Shreveport Common neighborhood, all weaved together to create the production, AS IS by Nick Cave. Nick Cave committed to spend a year in Shreveport, coming every month to work with what is close to 100 artists in our community ... and created a production of dance, of digital media, of singing, instrumental and spoken word. The message shed light on the great work that Providence House, Mercy Center, the VOA McAdoo and the VOA Lighthouse are doing as the authentic residents of Shreveport Common. A four-day National Art Critics Series culminated with this season’s UNSCENE! finale, UNDISPUTED! ART CHALLENGE at Millennium Studios. Eight artist teams competed for a single $10,000 cash prize before three art critics and a voting audience. Emmy Award winning (PeeWee’s Playhouse) artist, art director and puppeteer Wayne White designed a cadre of large-scale puppet characters from Shreveport Common’s history that, with the help of local artists, paraded through Shreveport Common with dancers, drummers, bands and stilt walkers. International award-winning chefs Sarah & Evan Rich brought their San Francisco Rich Table experience to the Municipal Auditorium, with 20 local culinary artists to create a UNique fresh food experience with artist and performer pairings. New Orleans-based AIRLIFT created interactive musical architecture and performances in an overgrown niche now named Calanthean Canyon. Musicians “played the houses” during a two-day debut with Theresa Andersson, Brittney Maddox, the Slade Collective and The Residents. Headliner Theresa Andersson with Luther Cox, Jr., Sereca Henderson and Joe Bluhm topped off a full-day of the Texas Ave Makers Fair. The day featured 225 vendors, four stages hosting local and regional artists, food trucks and the Holiday in Dixie Parade. Stan - the Record Man - Lewis Fest. A tribute to Rock ‘n Roll, Blues, Gospel and R&B music production history-maker, Stan Lewis. Featured an all-day line-up including Bobby Rush, Vickie Baker, Carl Sims, Ernie Johnson, Brady Blade, Sr. & The Hallelujah Train and Betty Lewis & The Executives. Legendary skateboarder and artist Steve Olson worked with local artists to create a “Skate-able Scupture” Public Art installation on an unused concrete slab. It continues to attract skateboarders and local performers. Artist team INSIDE OUT, along with local artists, photographed the neighbors, adding their faces – poster-sized – to a prominent brick wall at the entrance to Downtown/ SHREVEPORT COMMON, and including them in their international paste-up project. UNSCENE! joined TACA’s Makers Fair with artistic exercise, drum line parade, musical productions and food trucks capped by a DRIVE-IN Experience featuring PeeWee’s Big Adventure and more. UNSCENE! teamed with minicine?/Swampland, Inc. to extend the MSPS (McNeil Street Pumping Station) New Music Festival to include a Friday night prelude featuring the UNexpected in currently UNused places: “dinner party” with Peter Fetterman, Homer Flynn, rooftop DJ and artist markets.